Writer’s best friend Turn abstract ideas into concrete images like this schnauzer. Pretty abstract; pretty dull. I encouraged them to find a concrete detail to liven things up. Oh, I KNOW we have a lead. “Paint the schnauzer” is my new mantra for finding examples that prove the point. That’s important. Because everything we know about how people respond to information tells us that they’re more likely to pay attention to, understand, remember and act on concrete messages — painted schnauzers — than abstract ones, like keeping the kids out of trouble. So what’s the difference between abstract and concrete? Love is abstract. The woman in the red dress is concrete. We know the woman in the red dress concrete, because we can absorb her through our five senses. We can see her red dress. We smell the gin on her breath. When she falls off her chair and bumps into us, we can feel her. That’s the test for concreteness: Can we absorb it through one or more of our five senses? It’s the difference between showing and telling. “Show, don’t tell,” counseled Mark Twain, American author and wit. But a better bet may be to show and tell, to move from the top to the bottom of the ladder of abstraction. The ladder of abstraction is a model created by scholar, senator and semanticist S.I. Hayakawa. A bottom rung you want to reach To make your copy more vivid, hang out at the bottom of the ladder of abstraction. At the top of the ladder is the most abstract concept: the devastating problem of feline illiteracy, maybe. At the bottom is the most concrete example of that problem: say, my 13-pound Chartreaux cat, Gigi, who has not only taught herself to read and write but now mentors less fortunate mewlings. Love lives on the top rung of the ladder; the woman in the red dress on the bottom. Keeping the kids out of trouble over summer break sits at the top; the Pepto Bismol-slathered schnauzer is at the bottom. The top of the ladder is essential: There lies meaning. The bottom of the ladder is essential, too: There lies interest and understanding. Want to communicate better? Spend your time at the top and bottom of Hayakawa’s ladder. So don’t get stranded halfway up. How do you scale the abstraction ladder in your writing? What questions do you have about the ladder of abstraction? There’s a 1:1 correlation between colorful words and understanding. Colorful phrases are 400% more memorable than abstract phrases. Colorful details even change people's minds — and their behavior. 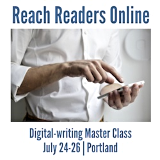 Want to learn how to use juicy details to move readers to act? 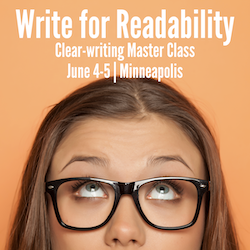 If so, bring Ann in to present Master the Art of Storytelling — a one- to two-day creative-writing workshop — to your team. Your team members will learn to tap the power of juicy details to make messages more effective.